Those were the words Lee Jenkins helped LeBron James pen in his famous Sports Illustrated cover story announcing the King’s return to Cleveland and the same phrase now fits for Jenkins. On Monday, the Los Angeles Clippers named the San Diego native the team’s Executive Director of Research and Identity. 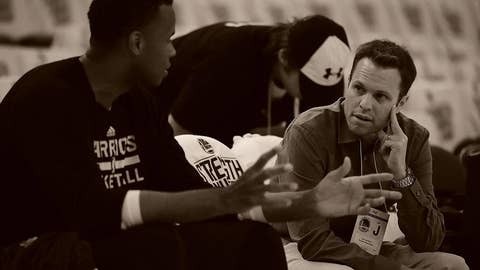 In the role, Jenkins will use his extensive reporting background and unique interviewing style to contribute to the franchise’s amateur and professional scouting infrastructure, as well as help to enhance the Clipper experience. At SI, Jenkins has written more than 70 cover stories for Sports Illustrated. In 2017, he was named the Jim Murray Memorial Foundation’s Journalist of the Year and won the Deadline Club’s award for prestige in sports writing. Jenkins is featured in this year’s edition of The Best American Sports Writing. Before joining SI in 2007, he spent four years at the New York Times, and before that the Orange County Register. “Sports Illustrated called on my 30th birthday, the greatest gift of my professional life,” Jenkins said in a post on SI.com. “I was one of those kids who grew up running to the mailbox on Thursday afternoons. SI taught me to read, and then, to write. With dream jobs, reality often disappoints, but everything about SI only exceeded my imagination. I’ve worked alongside my idols, Tim Layden, Tom Verducci and S.L. Price, and with my friends, Michael Rosenberg, Chris Ballard and Greg Bishop. There is no honor in this business like sharing a page with them. A native of San Diego, CA, Jenkins is a graduate of Vanderbilt University.